As Mongolia struggles to make deals over giant mining projects like Oyu Tolgoi and Tavan Tolgoi, the country’s politicians, economists, mining professionals, and the public refer to Erdenet, the Mongolian-Russian joint copper and molybdenum factory, arguing whether or not lessons of Erdenet would apply to these projects. Some demand investors to build a city like Erdenet near these projects while others pressure for more management involvement from the Mongolian government as well as senior positions for Mongolian citizens. From the initial PR campaign of foreign investors and Mongolian politicians, people believed in major economic development as well as spill-over benefits from these mining projects. In reality, it is very unlikely that today’s foreign investors will build cities for Mongolia and pouring money into large-scale shared value projects like the power plant, the smelter factory, or even a railroad as the Erdenet project did. If we’re taking Erdenet as a model for these reasons, we are wrong. However, the Erdenet mining project offers many other valuable lessons for Mongolian politicians and foreign investors even if the factory was built in 70s and 80s. For this blog post, I would like to highlight three lessons regarding the elite unity, the resource nationalism, and the state-ownership. The most important lesson that Erdenet offers for today’s politicians is elite unity for making, implementing, and honoring their decisions. In 1960s and 70s, Mongolian elites were united under the goal of national development as the country was regarded as the least developed and most aid-dependent among the communist bloc. Just like in 1990s, when experts of international financial institutions (e.g., IMF, WB, ADB) were advising Mongolia to use its natural resources to develop its economy, the Soviets and COMECOM in the 1960s were advising the same and invested into extensive joint geological explorations. Although Erdenet was found by Czechoslovakian geologists, the Czechoslovakian government was unable to respond to the Mongolian request for a joint venture because of the 1968 Prague Spring and the large-scale of the Erdenet project. So then, Mongolian political elites successfully lobbied Moscow (esp., Brezhnev and Premier Kosygin) to secure the Soviet investment into this large scale project. Initially Russians were reluctant, but there were other factors also played role in the Russian decision-making process. It had lost the potential copper supplier, Chile, following the coup d’etat in 1973, civil war had prevented Soviet investment in the copper deposit in Afghanistan, and its own deposit in Udokan was technically costly to operate. Mongolian political elites made the quick decision to attract the Soviet investment and provided political support for its professionals to implement the project. Of course, the decision-making process was easier in the authoritarian regime; however, we could not neglect the existence of the formal political institutions and procedures. Furthermore, it would be mistake if we neglect the political elites’ unity and their support for professionals – who implemented the project along with their Soviet counterparts. The most important lesson for today’s politicians is to withhold their rent and fame–seeking interests in regards with large-scale projects. Unity, timing and commitment for their decisions are the most critical factors for a landlocked country to attract foreign investors; otherwise the landlocked country is always unattractive due to the lack and cost of infrastructure (i.e., rails, energy, and water). Another lesson that Erdenet offers is experience dealing with the resource nationalization issues without interrupting the factory’s operation. There appear to be two main causes for Mongolia’s call for resource nationalization at the Erdenet. For one, as Mongolian high-ranking politicians and especially economists provided evidence of unequal trading patterns and inefficiency of the Erdenet factory due to the low export price and royalty exempt. After the issue was raised in 1983, two governments stopped the state subsidy for the Erdenet in 1985 and the royalty exempt was ended in 1991 [as agreed in the long-process of negotiations of 1980s]. The other issue was the rising discontent of Mongolian mining professionals and the public in Erdenet. As Mongolian mining professionals were educated and trained at the same schools in the USSR, their counterparts (i.e., Soviet expats) at Erdenet were paid two-three times higher and their promotions, as Mongolian professionals considered, did not follow the professional merit principles. The Soviet expats living in Erdenet had the privileges of separate housing, stores, hospitals, schools, kindergarten, and recreational facilities. In addition to public sentiments over “segregation”, crimes and violations of Soviet military personnel in Erdenet were rumored, but not officially disclosed to the public; this also contributed to the public discontent and even the sudden rise of anti-Soviet attitudes in Erdenet in 1989-1990s. 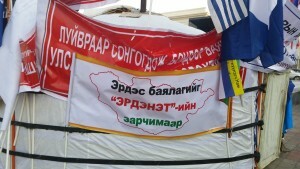 Unlike pro-democratization protests in Khovd province and Ulaanbaatar, Mongolian workers at Erdenet were actually protesting for the nationalization of the Erdenet factory, including demands for increasing Mongolia’s share of the factory, positions at the senior management, and salary/benefits for Mongolian workers. For example, in 1988, 75 percent of employees were Mongolians, but all senior management posts were filled by the Soviet expats. As a result of Mongolia’s discontent at the senior national government level, mining professionals, and the public, a number of compromises were made by 1991 through a long process of negotiations. Erdenet demonstrates that resource nationalization issues always remain on the table as the host state’s institutional and particularly professional capacity increases; therefore, both sides must have a stable, transparent process that will solve problems based on facts, evidence, and reasonable justification. This process must be insulated from the short-term political, economic, and social pressures. The other lesson we must learn from the Erdenet is why, how to protect the management of the State Owned Enterprise (SOE) from the rent-seeking political entrepreneurs, parties, and politico-business factions. Following Mongolia’s steadfast demand, the first Mongolian director was appointed in 1989 and Mongolia increased its equity share up to the 51 percent in 1991. Under the charismatic, highly-professional, and skillful manager, Sh Otgonbileg, the Erdenet factory survived the toughest periods of political and economic transitions of 1990s and was almost the only contributor for the country’s GDP. However, being the state-owned enterprise, it was considered as the honey pot for politicians, political parties, factions and for the others. For political parties, the Erdenet factory provides an administrative and logistical support to consolidate their party base in the second largest city of Erdenet as well as surrounding provinces. In order to do that, political parties need to have their supporters at all echelons of the state owned enterprises and launch campaigns among all 6000 employees. For entrepreneurial (i.e., opportunistic and rent-seeking) politicians and factions, the Erdenet is a place to win any contracts, ranging from heavy equipment to diary products. For this reason, they need to establish political and business connections with managers of the Erdenet or keep them in their political and business sphere of influence. For others, the Erdenet became the most “philanthropic organization” and also a supporter of the Mongolia’s leading athletes. In the absence of the ‘rule of law’, the Erdenet sets a bad example of the state ownership. All senior managerial posts of the Mongolian side became political. As a result, the top managerial posts became political posts, which changed after every parliamentary election, and these party-affiliated managers owe their support for respective political party, faction, and even individuals. A numerous allegations about non-transparent tenders and contracts will be surged during pre-election periods, but silenced after the election. In the absence of impartial, proper, and complete investigations and monitoring, Erdenet would still remain a honey pot for political and business rent-seekers. 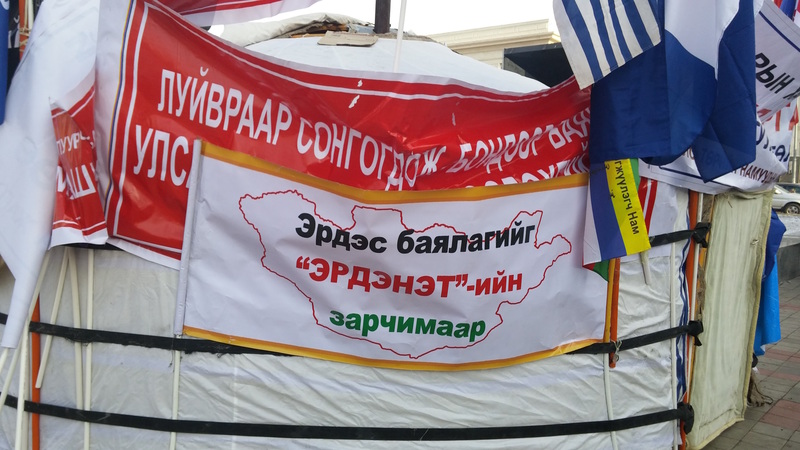 As portrayed in the photo of the opposition party protest in December 2015, politicians still believe there are lessons to be learned from the Erdenet mine; in the belief that it will trigger popular support. This is a reasonable strategy for the political party, but the parties need to be clear on what lessons we should learn from Erdenet – since this is the first largest copper factory not only in Mongolia, but in Asia, a pillar for the bilateral relations with Russia, and a catalyst and shaper of Mongolia’s mining governance from 1970s. In all, I stressed three main lessons we can draw from Erdenet: the importance of the unity of ruling elites for time-sensitive, major mining projects in a landlocked state, having the process to deal with the inevitable nationalization push, and insulating the state owned enterprises from the rent-seeking politicians, parties, and factions (unlike Erdenet). This entry was posted in CIRDI, Erdenet, Governance, Mining, Mining Governance and tagged MENDEE Jargalsaikhan. Bookmark the permalink. There were no connections between Chilean coup d’etat and Soviet intention to build Erdenet factory. Afghan civil war had begun in 1978-1979, not in 1973. Yes, you’re absolutely right about the timing of the civil war in Afghanistan. There are facts about the Soviet geological expeditions of 1960s and even some assistance in this regard in 1950s. My guess, as following these facts, is that Soviets were interested in Aynak copper mine, but it was not easy to talk about the mining operations. To be frank, I am not an expert on Afghan matters. I don’t think only Baabar is talking about this after going thorough Mongolian archival materials, doing interviews, and accessing secondary sources. Without establishing any connections from the Soviet and Chilean sources, you might be right there were no connections. But, I am very curious why Mongolian economists and some professionals – most of them studied and worked together with their Soviet counterparts – keep noting about this and advising that was the right time to convince the Soviets to invest into Erdenet. So,Baabar is not the only one who makes this fairy tale. This was talked, mentioned in documents of 1970s. Again, thank you for your substantive comments, but I would love to hear and learn from experts of Soviet mining. Hi Mendee, sorry that this is a comment on an old post — I will send it to you directly as well. I didn’t comment at the time this was posted but decided to now as I am seeing these discourses come up more and more, and some Mongolian scholars are reaching out to me for comment as to the historical record regarding them. I would like to see what sources you are getting the information about the Czech involvement, Chile, etc. from. If Baabar, can you tell me of the source? I have not dug much beyond the historical materials that circulate among GOK employees and Mongolian public more broadly. One thing that strikes me though is that these do mention the Czechoslovakian involvement in the geological surveys, as joint with the Soviet Union. I find it a big stretch that Czechoslovakian parties would have planned to start such a project as massive as Erdenet alone (and wonder, would these sources continue to talk about the Czechoslovakian involvement at all if something were being covered up to that degree?) There were also Czechoslovakian buses in use at Erdenet by GOK, possibly other equipment, until very recently, if not continuing up to now (many if not all of these buses have been replaced by Samsung, with which GOK has struck some much publicized contracts). As far as the issue of access to Chilean copper, I’ve not looked at the import/export figures for copper from Chile to the Soviet Union, that might help settle this more. I would also say that there were massive copper refining enterprises in Kazakhstan, that needed to be fed since other copper mines in USSR mostly exhausted at that point, experts to be sent (there are still Kazakhs from Kazakhstan, Kazakh Russians, Armenians in Erdenet), and see what Robert Rupen says about Erdenet as a “defensive shield” for the Baikal Corridor of the Trans-Siberian Railway in “How Mongolian is Really Ruled.” My sense is also that Chile would not be seen as a stable enough source of copper long term for such a strategically important commodity. Similar for Afghanistan, and I imagine that infrastructure costs would have been higher, but maybe idea was that returns of “soft power” etc. kind would have offset that. I am meaning to return to the Hoover Institute and look at some GARF microfilm they have relevant to Erdenet there, from the 1970s when there were actually two separate agreements, according to historical texts circulated for popular consumption (for instance, by Montsame on the occasion of Putin’s visit in 2009). Can follow up with you if you are interested.